Fudge is Christmas time favorite. Not many people stop to think what is behind the rich chocolate treat. Preparation: 15 minutes. Chill: 2-4 hours. Chopped pecans that have been soaked and dried before using, it is important that pecans are dry for the texture to be correct. Note: raw pecans or walnuts can be used. Melt the cooking oil in a warm pan or a double broiler over hot water make sure that the internal temperature of the coconut oil does not go above 100°F. To the cup of melted coconut oil, add the coconut nectar or raw honey, carob, and vanilla. Mix until everything is very smooth and it starts to get thick. It is important to keep stirring while in this process. This procedure will give the fudge a nice texture. Add the pecans and place into a cake pan. Cover it and refrigerate for at least an hour. Serve by cutting it into pieces and keep any leftovers in the refrigerator. How and who created fudge is disputed. One of the more popular stories takes place in 1886. “Oh fudge,” said the baker who messed up on a caramel candy recipe. The good news is that the fudge candy tasted good. What is undisputed is that in 1886 fudge was sold in Baltimore for forty cents a pound. In 1888 Emelyn Battersby Hartridge, a student at Vassar College in New York got the recipe for fudge and made it for the senior auction. This treat became very popular and desired by many women’s colleges. 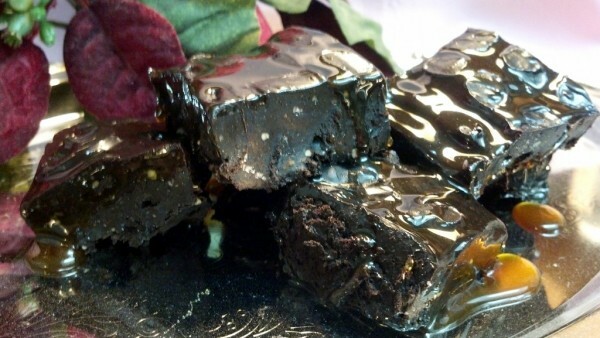 The first fudge recipe only has four ingredients. That is not the problem with fudge. Anyone who ever made an original fudge recipe knows that there is a trick to get it right. Fudge is very delicate and requires one to be very precise when measuring and constant stirring while it was cooking. Fudge so often fails because it is so easy to over or under cook. Over time with so many failed fudge attempts cooks started playing with the recipe to make it “fail proof.” If you are anything like me, then you will know that this is really a misnomer, even the fail proof failed. Even with all the different choices and recipes, fudge remains hard to make. The fudge that contains sugar and marshmallows is not good for the body and the butter is known for depositing fats and cholesterol into the blood stream. So how do you have your fudge and eat it without feeling guilty is a question most people have. They have made up their minds not to think about it. Along with many people I have given it much thought. In this recipe, there are three or five basic ingredients and then any additional ingredients such as nuts, coconut, or peanut butter. Instead of using butter and milk I use coconut oil and cacao butter. I mix the two so that the fudge will remain more stable at room temperature. On the positive side, if cacao butter cannot be found the recipe is just as good as made with just coconut oil. Coconut oil is good for the body both internally and externally. Many research studies have shown some of the coconut oil health benefits to include stress relief, maintaining cholesterol levels, relief from kidney problems and heart diseases. Instead of using cheep bad for you chocolate, I use carob powder and if I really want to be fancy, I use half cacao powder. Carob has been known to improve digestive health, lower cholesterol and regulate blood glucose levels. Raw cacao has higher levels of antioxidants than regular dark chocolate. Raw honey is the sweetener of choice for this recipe. Honey has been used to improve the immune system, heart disease and bad breath. For people who do not wish to use honey then the sweetener of choice is coconut nectar. Coconut nectar can be bought online or at health food stores. Let’s enjoy our fudge and have a Merry Christmas this year. For more information about living a balanced life visit www.summerbear.org.